Rollercoaster match here from Roger as he fought back from 2-0 down in the decider to defeat Radek Stepanek 6-2, 6-7(4), 6-3. I expected this one to be close in places but ultimately a straight sets victory for Fed. As it turned out it was a scrappy, topsy turvy affair and whilst not exactly pretty to watch ended up being a good match to win for the Swiss. There were a few worrying signs too considering he got broken 4 times but to come back from a break down in the final set is definitely a plus. I'll definitely take the win here and what was close to being a very tough loss ended up being a good win so we gotta be happy with that. Into the match recap we go and Roger got broken in his opening service game after missing a regulation backhand pass. He then broke back immediately and the first set went to the script as Federer closed it out in just over 30 minutes. Hitting 10 winners and just four unforced errors to win 6 of the last 7 games. I didn't realise at the time but there were early warning signs from Stepanek and the second set saw him take his game to a much higher level. The Czech broke to lead 2-1 and although he failed to serve it out at 5-4 he pulled away in the tie break to take it 7-4. It was a disappointing set for Roger to lose as he did the hard work to get back on serve but played a weak tie break. I thought he got drawn into playing the game Stepanek wanted to play rather than his own and gave his opponent too much rhythm. The final set was always going to be a lottery and with Stepanek coming close to taking a 3-0 lead another tough loss looked to be on the cards. Yet Roger had other ideas as he steadied himself, fought off 2 break points at 1-2 before then breaking to lead 3-2. 3-2 became 5-2 and at 40-15 victory was in sight, but of course he managed to break himself hitting 2 double faults to drop serve yet again. Luckily it didn't come back to haunt him as a Stepanek FH error in the next game handed Roger the victory on his 4th match point to move into the Quarter Finals where he will now meet Rosol. It was almost a bit too late for everything, but I kind of hung around and I took the positives out of the match. Radek did a good job of putting the pressure on me and mixing it up. From that standpoint, it was a really difficult match. I’m very pleased to come through. Weird is the best way to describe this match as it was such a volatile display from Roger. After looking consistent against Becker he was like a yoyo in this one, playing well in 1 game and terrible the next. It's not too much of a concern considering he won but to get broken in the first game of each set and serve 5 double faults at key times isn't great. I don't class Stepanek as a great returner but he managed to break 4 times which can't happen if he faces Djokovic in the semi finals. From my point of view I thought Federer got dragged into Stepaneks way of playing. Rather than stick to a pre determined gameplan he went toe to toe; this gave his opponent rhythm and opportunities to hit confidence boosting winners. When Roger wax mixing it up and moving forward things were well in his favour, a few dropped point later and he was bogged down at the back of the court having to half volley backhands constantly. But I think some credit must go to Stepanek too, he's a good match player and he undoubtedly prevented Roger from doing exactly what he wanted to do out there. I said pre match he was wily and I think that sums up how he plays well. He looks pretty scruffy in his t-shirt, hasn't got the most attractive game but is the kind of guy that will whoop you if you underestimate him. The good news is the positive of winning definitely outweighs any of the negatives :D. They say winning fixes everything and that's true here; it wasn't clinical or great viewing but the score reads 6-2 6-7(2) 6-3 in favour of Federer and that's all that matters. Next up for Roger is Lukas Rosol who I don't think needs any introduction here after his exploits at Wimbledon 2 years ago. These 2 have never met so it's a little tricky to know exactly how the matchup will be. I think it favours Roger as he does well against out and out aggressive opponents like Blake, Soderling and Davydenko etc. Rosol is uber aggressive and will look to hit winners from anywhere so plenty variety and moving forward should get the job done for Fed. I'll pick Roger in straights and as long as he doesn't get pinned back behind the baseline then it should be comfortable. 6-4 6-2. Allez! Topsy turvy. Too many breaks of serve but good mental toughness to come through. I think they are two completely different matches. If he makes the semis and Djoker does too then Stepanek match has no real bearing. If anything he should be confident after winning a close one. I think he moved pretty well really, looked sharp, just his level was up and down. Strange how often he got broken on a fast court though. Very bizarre indeed. The big plus as you say Jonathan is that he managed to pull it out, and that in itself is good practice for him. I think you’re right too in that part of Fed’s problem was that the Radek who showed up was not the same Radek he’d already beaten 12 or 13 times, & kudos to him for bringing some inspired tennis to the match. There were some awesome gets in the highlights – of course he’s helped by his wingspan here. Fed seemed though to still be moving freely which I’m delighted to see. I hope he calls Stefan tomorrow – I hope they’ve reached that stage. Some cool-headed perspective could be just what the doctor ordered. Certainly he needs to improve his mental place if he’s to face Djokovic. There were a couple of places in the highlights where I thought he was back to last year’s trick of returning the ball right where his opponent was, instead of where he wasn’t. In the months coming up he’s got virtually no points to defend, & evidence of some people coming back to him (so sorry about Juan Martin) – but he’s not there yet, and he made the semis here last year. I’d really like to see him make the final, but since it’s Nole potentially in the semis, I’d be happy if he made it that far as long as he brought a great game to Nole. Yeah I thought Fed moved really well again. Was hitting the ball cleanly just almost had no plan out there. I think he makes Semi’s for sure. Djoker looking good though. Djoker is looking very good. Blew away Bautista-Agut today. But it’s all about on the day. Well weird match is the right word for it. Roger played a solid match but in a weird way he also played a very crappy match, throwing in some errors and doublefaults when least exspected. But he pulled it off and shouldent be to bothered by Rosol. I like Roger is very aggresive, but he´s going for power alone and is playing to much over the baseline. He needs to play with angles also otherwise it gets to predictible , and you could see Stepanek also quickly finding out it was coming with power over the baseline constantly. Djokovic really played amazing today, so Roger needs to step it up before the semis that´s for sure. I disagree with that tbh, I thought that if anything Stepanek was far more dangerous when Roger gave him angles to work with, he is pretty good at moving the ball from corner to corner. I thought giving him zero angles to work with was his most profitable type of play, then stepping in on the short ball. Should have varied his pace a bit more. We have the same idea of strategy but it was way to one sided, only power and mostly over the baseline. 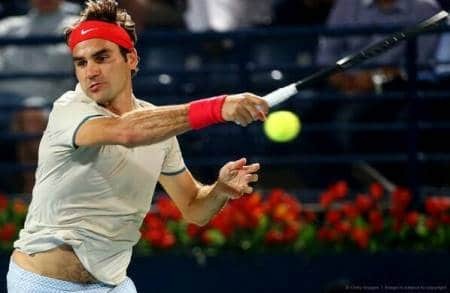 It needs to be more varied when he faces tougher opponents otherwise they can just wait for the ball and use all Fed´s power against himself. Hi Jonanathan That was a little too close for comfort not quite sure how he managed A to get into such a mess after the 1st set and then to pull it out of the bag in the third – so glad he did lets hope he has his thinking head on when he meets Losol On a another note hated the outfit – poorest one I have seen for a long time only good thing about it are the shoes and the headband – could we all please pray that he decides not to play in his pyjamas anymore I think he thinks it is time for bed and is forgetting he has a tennis match to win! I like the darker one. The light brown / cream whatever you wanna call it is pretty awful though! Haha! I said the same to my husband on watching highlights if the first set! White and cream NEVER works and yes that combo is definitely sleepwear! Jonathan, good summary, as always. This was not a good match for Fed fans to watch. The first set game plan was good, despite the misses in the first game. The second was downhill from the first game, and Federer forgot his game plan to move forward and attend. Plus too many shots hit the top of the tape, just missed (why not have some margin for error, I wonder). I thought Stepanek gave away the break when serving for the set. Not a good tie break. Very poor start to the third set, and Fed was lucky not be broken again in the third game. Plus Stapanek’s game dropped sharply in the third set. In fact he was ready to concede at 40-30 at 5-2, but Federer did not challenge an ace which was called out. I was really glad that Stepanek basically quit at 5-3, as I was quite worried about Federer being able to serve out at 5-4. I do hope the good Fed returns against Rosol. We will need Jesus Fed against Novak! Yeah up and down. I think he showed some fight though to come back from 2-0 down in the final set. Especially after dropping the tie break considering he broke back to force it in the first place. Overall a good win, but has to keep improving which I think he will do. Yeah but interestingly, never thought he wld lose. But enough with the concentration lapses, onwards to Rosol and The Serb!! If memory serves me right, it was on 40-15, ie., on previous double fault! Lets be serious, Roger Federer was not about to lose to a man who looks as if he should be somebodies grandfather, or my dad thinks he looks life a frog (which my mum agrees on). Though it’s funny, before Fed servec for the match I assured my mum that Roger Federer these days, regardless of his dominance leading up to, makes heavy weather of serving out matches, always makes it closer than it should be. However, today was clearly going to be an exception since he was 40-15 up, peace of cake… I mean it’s not as if he struggled serving out against Becker 2 days before or anything… he needs a good slap, really deserves a big one. Did you shoulder barge him? Was only able to watch the match highlights on sky tonight! Really odd game with Fed in and out of the match. Thought he was a little stubborn in refusing to let the ball drop at times and trying too hard to take every ball early, pretty tough to maintain that at all times. Part if the reason for today’s match lies with his serve which he over hit at times on 2nd serve. Where is the old Fed 2nd serve? Accuracy over pace! Does the new racquet prevent this? The first set outfit was horrendous! Like he had dressed in the dark!! But then he changed shirt and his form dropped!! He will beat Rosol who isn’t as good a match player as Radek. But yes, one match at a time!! His mental strength is however, already proving to be far less brittle than last year !! But yet again, where was the split step coming in for the volley. Sometimes he literally walks straight thru the volley and it is no surprise that he misses as his balance is slightly off!! Stefan? Are you watching? I think it is good for Roger to win ugly. He will need to do that, I think from now on. Roger needs to get even more mentally strong so he can grit his teeth and just go after a win. I just don’t about these tiebreak situations as he doesn’t seem to be able to lift his game during the tiebreaker. He certainly won pretty tonight! Although after being 2-0 up Rosol was very average. Only has one game! Berdych deffo the man in form. Novak hasn’t played enough to judge. Fed has nothing to lose! Really hope he can put one over on him! About time ! Has to serve brilliantly!! Lucky win for Roger. If Stepanek had served better than his 49% and cut down on his sometimes horrific unforced, he could have pulled off the win. Not what we expected from Roger. In spite of moving great again, he cannot try to runaround from the baseline like Dull. He needs to stay aggressive and return better if wants to be back in the top 3. Being broken 4 times in 3 sets is not good. He was able to get away with it breaking Stepanek 8 times. Not going to happen against the top players. Especially not against Djoker or Dull. Odd match, the Fed we know there will be one match where he totally on shank-fest and horrible stats. Typically towards tail end of tourney. Positive side maybe he will shake off bad match and play better which he usually does. Now, it might just be wishful thinking. I hope he proves me wrong. A win is still a win, yes? A win is a win anyway, and the important thing, as others have said, is that Roger found the mental strength to get through it. The big difference between this match and last year is that in spite of how badly it was going, it wasn’t until Roger got broken in the third set that I started to worry he might lose. Last year I would have been worried from the outset. The important thing, as others have said, is that he found the mental strength to get through it. Apologies for repeating myself a bit in the last post. I’m having a bit of a strange day! Hey guys, up next a very interesting match Berdych vs Jo Willy. That winner will be the finalist. I think it will be Berdych. You guys seem so calm about Rosol, but I am not at all. Very worried right now. This is the real Rafa-beater. I think Rosol will want to make history and tweet something like I defeated the two greatest of all time. I am so worried. Come on Roger. Please one easy match. Novak will destroy Joezhnny as well (like yesterday against Bautista-Agut) so he will be very rested for his SF against you…..
Ps: guys, what is wrong with Rafa, Novak and Roger?? Serving for the match and all three getting broken…. So why were you worried. Rosol plays exactly the in imaginative game that Roger deals with very easily. He didn’t hv to do that much as Rosol either red lines or misses as he did tonight. Fed was solid throughout! Loved the passing shot off the Rosol lob! Highlight!! Djoker gets a walkover as Youzhny has withdrawn. Waiting to hear if Fed’s match gets moved forward. He was always second night match so it hasn’t changed. Berdych / Tsonga is now the first instead of Djoker. Don’t agree. Djoko hasn’t played enough and Fed is a real test to come in a bit cold to. Fed in 3 sets for me! Now I’m having little to no expectations about Federer winning the tournament. Seriously, Roger cannot get a break can he, the older he gets…. Novak is a) in dangerous form b) wellrested c) younger and faster. And Roger will win late at night and have less time to rest… He cannot catch a break can he?? Dubai is also about money??? Roger’s match yesterday was fuller than Novak’s, so they have him now as last one??? Atleast one good thing will come out of this. If Novak gives his winner speech Sunday, he wil KNOW that if Roger was wellrested things could have been different…..
And you forgot the the easier draws like in the Aussie Open… 3 Top 10s in a row… It doesn’t get more easier than that no? A peculiar match but good win for Fed in the end. But why on earth does he create unnecessary drama so often forcing us to repeat the mantra ‘HOLD’? Then been broken 4 times??? BTW, excellent sum up of Stepanek, Jonathan. Is that true he’s dating with Petra Kvitva? Huh? Roger defeats “Rafa-beater” and no new comments (or is there something wrong with my laptop)??? I guess we are all waiting for your article Jonathan…. Happy now! And he will be rested, less than an hour and Djoko will be bit cold so Fed will win in 3! A win is a win is a win. Simple as. 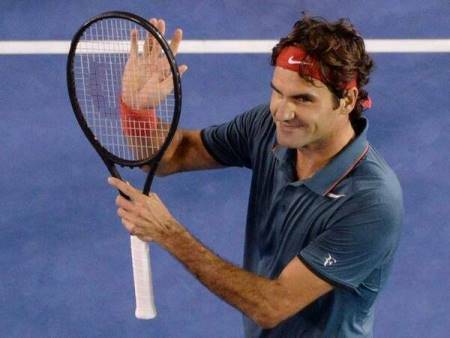 If Roger played way better than he did against Stepanek and lost – would any of ye be pleased? No is the simple answer. The fact of the matter is how he responds for the rest of the tournament. That is the real question. And yes it is good when Roger is challenged from time to time, because when he gets through these matches it builds backbone and mental strength. Nadal SHOULD have been beaten by Andujar last week but he wasn’t and that makes him mentally stronger. The same I believe will be true of Roger. And can he beat Djokovic? Absolutely! Time will tell.